The conversation in conference had reminded me of sitting across from a young chiropractor years prior trying to explain chiropractic to me. The field of Chiropractic revolves around the concept that misalignment of the spine results in disease, and that returning the spine to its appropriate curvature restores health. 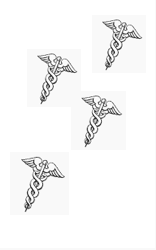 The proof is visual – chiropractors show xrays of before and after spines as proof. The wider medical community, of course, scoffs at such presentations. Where are the sham controlled trials of these manipulations, I asked. Couldn’t this all be a placebo? The chiropractor rolled her eyes – it was obvious, couldn’t you see? A few years later and cardiologists sound like chiropractors. One wonders if cardiologists would come to the defense of negative sham trials of chiropractors by citing small sample size, and the other usual suspects we were resorting to. Clearly, if we hope to maintain some credibility as practitioners of science, we need better arguments than chiropractors to explain what it is we do and why we do it. A 58 year old woman was sent to me by a concerned primary care physician for chest discomfort on a Friday afternoon. She was leaving to go on vacation with her husband later that evening for the weekend, but had been having this pesky chest discomfort that had started after a renewed effort at exercising after a long hiatus 2 weeks prior. She described chest discomfort in the middle of the chest only when she exercised. The pain was relieved with rest. On inquiring about progression of her symptoms, she noted that she had just felt the same chest discomfort walking the 40 feet from the elevator to my office. She was anxious, but in no distress as she sat in my exam room. An electrocardiogram was completely normal. I grimaced and told her she should cancel her weekend plans as her story made me highly suspicious that she may have a tight narrowing of an artery that was feeding her heart muscle. She protested that the ECG was normal! I told her an ECG at rest was unlikely to reveal a significant narrowing. She reluctantly went to the hospital with a plan for a coronary angiogram on Monday. Three hours later I received a sheepish call from the resident now taking care of her in the hospital. She wanted to leave against medical advicen – Her initial set of cardiac enzymes had been negative. I trudged over to talk to her. I told her I was happy her cardiac markers were negative, but I was concerned about the workload she was having symptoms with – it would appear she had progressed from having symptoms with running only to having symptoms walking down my hallway. While it was entirely possible she could have a quiet weekend at home and come back for her procedure, I thought it was safest to hang out 15 minutes from a cath lab just in case her symptoms progressed and necessitated an urgent intervention. The next morning she had an episode of chest pain that was instantaneously relieved by nitroglycerin, and on Monday she had a cardiac catheterization that demonstrated a 95% proximal lesion in her left anterior descending artery. She had a stent placed immediately after. Since the stent was placed she has had multiple episodes of chest pain – none as typical as her presenting complaint. This is supposedly a happy outcome, but the immediate question in light of ORBITA that emerges regards the proof that the symptom relief in this case wasn’t a placebo? Specifically, would a sham procedure have resulted in similar results? Based on a negative sham trial, the charge has been made that arteries have been opened for 40 years with no basis. Answering this charge requires a basic understanding of how the status quo in cardiology emerged. Demonstrating that the underlying mechanism of angina related to an epicardial obstruction was suspected, but started to solidify after a necropsy study of 355 hearts demonstrated that every patient who developed angina was noted to have significant narrowing or occlusion of the coronary arteries. Importantly, however, the study also noted that “complete occlusion or considerable narrowing of one or more coronary arteries may exist without giving rise to any clinical symptoms or signs”. Thirty eight cases demonstrated occlusions, and an additional 34 cases noted significant narrowing, yet none of these patients had demonstrated any cardiovascular symptoms in their life. The researchers were also able to posit why this may be the case by injecting the coronary arteries with a lead agar suspension that was able to penetrate channels > 40 microns. This was elegantly brilliant. The normal coronary arteries are split into a right and left coronary system, each with a separate entrances from the aorta. In normal coronary arteries, injection of the lead agar suspension into the right coronary vasculature would not result in any lead agar suspension appearing in the left coronary system. Yet this is exactly what happened in some patients! These patients, as in the image below, had developed a natural autobypass (collateral circulation) from the unobstructed coronary tree to supply the area distal to the stenosis. This was why some patients with severe coronary disease appeared to live their lives free of angina. It was suspected that patients with sudden occlusions that did not have time to develop collaterals were the ones at risk of developing symptoms. It would take another thirty years of technological advances and many failures to accurately measure coronary blood flow in the beating heart. The key to success was the use of perivascular doppler to measure coronary flow under resting conditions and ‘stress’ conditions. During stress conditions (like exercise), increased myocardial oxygen demand requires an increase in coronary blood flow which normally takes place as a result of local release of substances that dilate the coronary artery and increase flow. Narrowing of the coronary arteries should restrict the ability to increase flow in response to stress and cause angina. This was elegantly displayed in a dog model that measured flow serially as a micrometer constrictor was serially tightened around the left circumflex artery. Important point: the % stenosis was calculated not based on the angiographic appearance of the lesion, but rather the change in diameter of the micrometer around the coronary artery. Coronary blood flow is demonstrated in a left circumflex artery with no constriction (top part of the figure) and with an 82% stenosis at baseline (bottom part of the figure) and after injection of a coronary vasodilator. Coronary flow is seen to be markedly attenuated in the setting of a significant stenosis after injection of a coronary vasodilator. Plotting % stenosis vs coronary blood flow generates the famous figure shown below, demonstrating the progressive decrease in maximal coronary blood flow (otherwise known as coronary flow reserve (CFR)) as stenosis worsens. Resting coronary flow is not impacted until an 85% stenosis is present, and while hyperemic coronary flow in response to vasodilation starts to be affected around ~40% stenosis, significant decreases are noted only with high grade stenosis (>85%). This same seminal study studied myocardial radioactive tracer uptake at rest and with coronary vasodilation in the stenosed circumflex artery. Uptake of tracer is directly related to flow, so less flow to myocardium means fewer counts of tracer measured in myocardium with poor flow. The left anterior descending artery (with no stenosis) was used as a control. As predicted, at rest, counts in the 80% stenosed circumflex artery were similar to the left anterior descending (LAD) artery with no stenosis. Tracer uptake with coronary vasodilation, however, demonstrated a marked reduction in tracer uptake in the circumflex vessel relative to the LAD. While most cardiologists will recognize this study as establishing some of the basic tenets with regards to management of patients with stable ischemic heart disease (SIHD) as it relates to coronary stenosis and stress myocardial perfusion imaging, most will certainly not recall the conclusions of the authors with regards to the clinical applicability of their findings. It bears reiterating that the seminal paper that served as the basis for the opening of narrowed arteries seen on angiography warned that angiography alone was unlikely to be precise enough to isolate the truly critical stenoses causing important reductions in coronary blood flow that resulted in angina. At the time the only recourse for patients with angina was open heart bypass surgery that had been developed and was being perfected by René Favaloro, an Argentine surgeon. It was only a short 3 years later in 1977 that Andreas Gruentzig used a home made catheter balloon to open up the artery of a young man with crippling angina that was desperate to try any option that did not involve open heart surgery. The audacious but wildly successful attempt by Gruentzig ushered in widespread adoption of coronary angiograms to diagnose coronary artery disease. At the time visual assessments of coronary angiogram was the only assessment of coronary blood flow possible in the cardiac catheterization lab, and it is thus not surprising that cardiologists used the only tool they had at the time in making decisions. It remains the case that chest pain is the key complaint that starts cardiologists on a hunt for significant coronary artery disease. The satisfying finding of significant coronary artery disease linked the symptom to anatomy and result resulted in therapy. Patient and doctors felt better and all was good in the world. ORBITA challenges this basic paradigm. Instead of an immediate stent, patients were taken off the cath lab table and placed on upto three antianginal medications. 6 weeks later patients had their angina assessed and had an exercise treadmill stress test. Half the group then went on to get a stent. Another 6 weeks passed before all the patients had another exercise treadmill stress test and an assessment of their anginal symptoms. There was no significant difference in exercise time or in angina frequency. These results form the basis of the unnerving claim made by ORBITA: relieving an epicardial obstruction may not be fundamental to relieving angina. On the face of it, this appears to be a blow to the model of angina and coronary flow that has been forty years in the making. If the physiologic model that tightly links angina-epicardial obstruction and coronary flow together is as described, it shouldn’t take 1000 patient trial to demonstrate this – it should take one. This requires an explanation beyond the usual generic criticisms that can be hurled at any sham randomized control trial. The problem with ORBITA relates to the sloppy fashion cardiologists over the years have decided chest pain is angina. Before angiograms defined coronary anatomy, angina was defined only with the classic triad of sternal chest pain made worse by exertion and relieved by rest. This hews to the model of coronary blood flow reduction with stress. Unfortunately there are a number of patients that die suddenly of a heart attack who don’t have typical angina. This creates an environment where every complaint of chest pain needs to be evaluated for the underlying presence of coronary artery disease. It doesn’t help patients much if you confidently tell them they don’t have angina but they drop dead of a heart attack the following day. So it came to be that finding a high grade coronary lesion became the way to link chest pain to angina. But there’s a clear problem with this approach. Autopsy studies to help establish the prevalence of significant coronary lesions demonstrated that a 55 year old man with chest pain that improved with exertion had a 20% chance of having a >70% coronary lesion. To be clear, chest pain that improves with exertion is not angina. The coronary stenosis found in this case is akin to the incidental pancreatic cyst found in the millions of CAT scans done in Emergency Departments for abdominal pain. It shouldn’t surprise anyone that opening arteries in these cases may be of limited value. ORBITA : A study of chest pain or angina? While meticulous in many aspects, ORBITA was relatively lax at defining angina at entry into the trial. Patients were ‘judged to have angina or an equivalent symptom” by their cardiologist in order to participate. This could mean left arm pain, or something as vague as shortness of breath. In their defense, the investigators were no doubt attempting to mimic the actual practice of cardiologists. They succeeded! It should not, after all, be the investigator’s fault that cardiologists may be loose in their definition of angina if that was indeed the reason for catheterization and stenting. The contrast between inclusion in ORBITA and the only other similar trial (ACME) to test the effect of angioplasty and medications is striking. ACME was not a sham trial – patients and investigators were aware of having an intervention – but it did compare stents and medication in stable single vessel CAD patients with angina. To enroll, patients had to have stable angina, a markedly positive exercise treadmill stress test (ST depressions > 3mm), or a recent myocardial infarction within 3 months. Patients without ST depression were allowed in, but only if there was significant ischemia noted on myocardial perfusion imaging. Here you can see the investigators clear attempts to not rely on the patients or physicians labeling of ‘angina’. This is the key difference that may explain why the results in ACME were striking in a way ORBITA was not. The average increment in exercise time from baseline was ~ 2minutes compared to 26 seconds in ORBITA. When we speak of effect sizes ,we are of course speaking of averages. This is how the data is presented, and the comparison of the means is what the analysis of clinical trials in general rests on. The advantage of taking an average effect size of a population is that it effectively smooths out random outliers that may be misleading – the achilles heel of clinical anecdotes – but there is an important assumption inherent within this analysis that may be just as misleading. Specifically, one must assume that the population being studied is homogenous enough to have approximately the same response for most patients. As an example, if 90 patients improved their exercise time 10 seconds and 10 patients improved 60 seconds, the average improvement in the group is 15 seconds – the mean here hides much more than it reveals. As has been discussed already, the entry criteria for ORBITA patients makes it entirely possible patients with and without angina were lumped together. But other clues to ORBITA’s heterogeneity lie in the spread of baseline exercise times seen – the confidence intervals provided demonstrate exercise times that ranged from 1.6 minutes to 14.6 minutes! To paraphrase our loquacious tweeter in chief, this difference is yuuge! Exercise times were measured based on a smoothed Bruce Treadmill protocol which gets logarithmically more difficult the further you go. To average a patient who exercises 1.5 minutes with one who exercises 14 minutes is akin to including me and Lance Armstrong in a trial testing exercise time change from a new erythropoeitic agent, average our responses and then pretend this average would apply to the entire population. So even if we can be confident ORBITA included patients that had a high probability of exercise limiting angina, the question the clinican reading this should have is: For two patients with similar exercise capacity, how does sham compare to a stent? Lumping a wide variety of patients together makes it hard for ORBITA to answer this question. While there is clearly a group of patients that don’t benefit (perhaps patients exercising 14 minutes) , we can’t rule out another group may benefit (Low exercise time angina limited patients?). I find many of the other criticisms of ORBITA to be less than fair. Many have problems that the study was underpowered and had too short a follow up to comment appropriately on symptoms. I have a problem with neither. If it takes more than six weeks and two hundred patients to demonstrate a stent will relieve angina, the effect size of stents is considerably more modest than we think. I puzzled over how the investigators arrived at their estimates for their power analysis for some time. It’s worth pointing out that given the standard deviation of baseline exercise times predicted by ACME and observed in ORBITA, the study was underpowered to find a 30 second increment from baseline. The study was instead powered appropriately (Beta – 80%, Alpha 5%) to find a difference in exercise times of 30 seconds between medication/sham and medication/stent arm with an expected standard deviation of 75 seconds. So imagine the average exercise time of me and Lance Armstrong compared to the average of the other group that has Will Smith and Danny Devito. I’m not sure what the average of me and Lance means, and I’m even less sure of what the difference in averages between me/lance and Danny Devito/Will Smith. Regardless of this nitpicking, the fact remains that a large observed effect size (ACME differential between the 2 groups was 90 seconds) would have made all these points moot. While a 30 second increment in exercise time from baseline in patients with single vessel disease who are already maximally medically treated is nothing to be ashamed of, I would be a little embarrassed if this was the entirety of the effect size one derives from the hundreds of thousands of stents placed a year. Some also point to the aggressive medical therapy (titrating up to 3 antianginals, and up to 3 cardiology consultations / week) resulting in this group overperforming and thus placing stents at a disadvantage. I disagree here as well. Stents are an expensive, resource heavy endeavor that rarely but occasionally can have devastating procedural complications. If the stent can be brought to its knees by phone calls and medications, the world of interventional cardiology has much to be concerned about. The medication regimen in ORBITA was more aggressive than ACME with a higher percentages of patients on ACE/Betablockers/nitrates but it would seem not enough (Long acting nitrates 50-> 67%, betablocker 50->80%, CCB 70->90%) to make a difference in exercise of times between stent and medications of 90 seconds (seen in ACME) disappear in ORBITA. Spending too much time nitpicking what ORBITA was actually powered to do misses the very real and valid conclusion that for many patients in the population tested, the advantage of stents on symptoms and exercise time was found to be quite small. The appropriate conclusion from ORBITA may very well be that a group of patients being stented in cath labs today will have a small benefit relative to symptoms and exercise time, but this ignores the other major reason cardiologists place stents: they believe it possible stents may prevent future heart attacks. The problem facing cardiologists is that coronary disease remains one of the leading causes of death and morbidity in the population. But while it has been clear for some time that the presence of coronary artery disease made it more likely you would suffer a coronary event, many patients with coronary artery disease lived to a grand old age never bothered by the plaque that obstructed their arteries. It has also been evident for sometime that functional status was a powerful differentiator that placed patients on very different survival curves. This was quantified by having patients do graded exercise treadmill tests with a continuous ECG monitor. 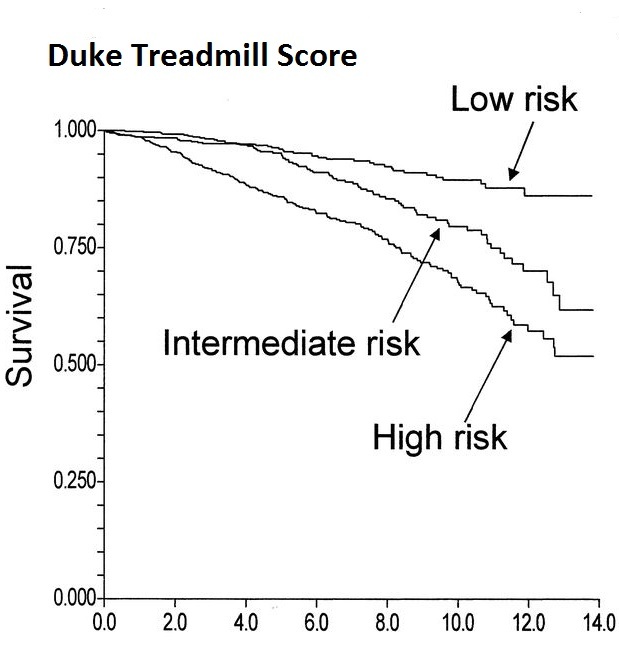 The performance on the test could be graded using the now ubiquitous Duke Treadmill Score which combined exercise time, degree of Ecg change seen and the symptoms seem to occur during the test. As crystal balls go, the Duke Treadmill Test was impressive. It seemed reasonable based on the poor survival of the high risk group to target this population for revascularization. Of course this was not the only group where further study took place. Low risk does not necessarily mean no risk, and it was left to the clinician’s judgement whether or not to offer revascularization. So if a low risk patient found themselves on a Cath lab table and a high grade lesion is found subtending a large area of myocardium, cardiologists have traditionally tended to err on the side of opening the lesion. This occured despite the fact that even data from 1984 that examined the use of bypass grafts for stable single vessel disease did not show a clear reduction in future heart attacks or death. The backlash now faced by the revascularization community stems from the very real phenomenon of overuse in this arena. But as the famed statistician Frank Harrell is fond of saying: the absence of evidence should not imply evidence of absence. Clearly some low risk patients do have bad outcomes, and thus it is plausible that some patients do benefit from a liberal use of revascularization. The difficulty lies in separating the wheat from the chaff and that is understandably much more difficult in low risk patient populations. The pessimists view of negative trials like the COURAGE trial that randomized (in an unblinded fashion) patients with stable coronary artery disease to stents or medical therapy and did not show a difference in hard outcomes is that no patients benefit from revascularization. The optimist looks for subgroups within the stable coronary artery disease cohort that did benefit. Just such a signal seemed to emerge when cardiologists started testing a strategy that takes the field back to the elegant coronary flow curves measured at stress and rest. It turned out that Gould & Lipscomb’s concerns in 1974 about angiography had been well founded. They had noted that visual angiography was likely unable to assess coronary flow limitations in a meaningful way, and had urged development of a more physiologic parameter to serve as a guide. Warning forgotten, cardiologists had since relied on an operator visually estimating the severity of a lesion based on a 2dimensional picture. The limitation of reducing a 3 dimensional complex lesion to a 2 dimensional slice means that many lesions may be overestimated, and some are certainly underestimated as well. Interventional cardiologists luckily seemed to have made a leap forward by returning to their physiologic roots. In 1996, De Bruyne and colleagues used a high fidelity pressure wire placed across a stenosis to measure proximal and distal pressures under rest conditions and after injection of a coronary vasodilator to increase coronary blood flow (Sound familiar?). The greater the pressure drop measured across the stenotic lesion, the more physiologically significant the lesion. Perhaps more important than the positive correlation of FFR to the accepted gold standards for ischemia of the time (stress testing, coronary angiography), studies of the prognostic significance of FFR showed it to be an improvement over angiography. The largest and most robust trial of FFR is the FAME-2 trial that randomized patients with stable coronary disease being considered for a stent to an FFR guided approach to stenting. The trial had to be stopped early because those patients with physiologically significant FFR lesions randomized to medical therapy had to be urgently revascularized at a much higher rate than those who had been stented. Half of the patients who had to be urgently revascularized had chest pain associated with ST depressions. Limitations of the study relate to the lack of blinding – patients and the cardiologists taking care of them knew they had significant unstented coronary lesions and this may have biased the decision to stent. But even if one removes the patients stented without ecg changes or bio markers that demonstrated heart damage, the numbers remain concerning – 25 patients in the unstented medical arm vs 6 patients in the stented arm returned for stenting in an urgent fashion. A recent contemporary review goes to great lengths to minimize the urgent revascularization story by suggesting the simple passage of a wire across a very significant plaque may have caused disruption of the plaque and thus been the impetus for revascularization. However, the survival curves appear to separate early, and keep separating up to one year after randomization, demonstrating a large number of late events that would appear to have nothing to do with passage of a wire months prior. The FFR story of ORBITA also provides fertile grounds for discussion. On the face of it, the average FFR in ORBITA’s patients was a very low 0.69. This is similar to the average FFR in the FAME trials. Yet an important distinction exists. 28-30% of patients in ORBITA had FFRs in a range that would have been excluded from FAME. The average FFR may be the same, but the spread of FFRs is significantly wider. So once again the heterogeneity of the patients in ORBITA limits its applicability to the patient in room 1 who gets squeezing chest pain after walking for 2 minutes on a treadmill. Regardless of the spread, there is no debate that ORBITA was not designed to show a difference in hard events. FAME2 randomized ~800 patients and followed them for one year to show a total of 42 hard events (chest pain without ECG changes, or biomarker positive excluded) in the medically treated arm. One patient in the medical treatment arm in ORBITA had an acute coronary syndrome, and two patients had severe bleeding on dual antiplatelet therapy and ultimately needed to be stented. Was this a play of chance, or would a 3% rate of crossover to stents hold up in a 1000 patient trial? Other than 4 stents that had to be placed immediately after plaque disruption related to wiring of the coronary artery, no complications resulted in the stent arm of ORBITA. The study was too small, of course, to capture complications related to stenting – but the best data available from the NCDR registry suggests the risk of dying from elective stenting to be 1 in 500. This number may appear high in isolation, but a fair body of evidence exists to suggest there are real and significant risks that accrue to patients directed towards medical therapy (3/100 patients in ORBITA and 9/100 patients in FAME-2). ORBITA would seem to have confirmed for some that biology does not matter. I think the opposite. Understanding ORBITA, or for that matter, any other clinical trial is woefully inadequate without an understanding of the physiology that underlies the disease being studied. This by no means suggests that understanding biology will keep clinicians and their patients away from dead ends in medicine. We are limited by our current understanding of the world, and can only hope to continue to expand our understanding of the underlying mechanisms of disease if we hope to continue to make progress. Critics point to right turns in medicine as evidence that scientific progress is something that needs to be micromanaged by a department of statistical certainty. As proof, any number of trials that have overturned the overconfident clinician are cited. In the ORBITA space, the paper most often cited to weaken the knees of the experts is a paper that examined a common practice in the mid 20th century in patients with refractory angina: ligation of the internal mammary artery. It had became a commonplace idea based mostly on case reports to ligate the internal mammary artery to treat refractory angina. Astounding anecdotes were reported of patients with severe angina that were ‘cured’ with this procedure. The procedure did not hold up to the scrutiny of a sham trial. 17 patients with severe limiting angina randomized in a double blind fashion to a sham incision or ligation not only showed no differences in the groups, but some who had a sham procedure even improved. The most marked improvement occurred in patient #14, who demonstrated a marked improvement in angina, and completed the treadmill stress protocol postoperatively even though he had limiting angina with ‘striking’ ECG changes prior. The only problem with this happy outcome was that his internal mammary artery had been untouched. This would all appear to be a fairly damning indictment of bioplausibility as a basis for making clinical decisions. But this most famous sham trial has some problems bearing up to scrutiny as well. First, while a plausible explanation had been elucidated – IMA ligation was thought to increase coronary flow by promoting collateralization – there was no actual evidence to support this. Part of the impetus for the sham trial was an IMA ligation trial in dogs that had not demonstrated any increase in coronary flow. And the striking ECG changes in patient #14 that served to prove the futility of IMA ligation? T wave inversions can certainly represent ischemia, and when associated with angina, may be concerning. But T wave inversions are a non-specific finding for ischemia. For this reason, the development of significant ST depressions are used to decide if an ECG treadmill test is positive for ischemia or not. It is true that while the stress test was technically negative for ECG evidence of ischemia, even in 2017, a patient with chest pain after a minute on the treadmill with T wave inversions would probably prompt a coronary angiogram to search for evidence of epicardial coronary artery disease. The presence of exertional chest pain, relieved by rest with concomitant coronary obstruction makes the diagnosis of angina. Everything else is suspect. There was no way of knowing if patient #14 actually had angina. In 1959, coronary angiograms were far from routine – Mason Sones had just accidentally injected the coronary arteries with contrast to prove the concept one year prior. Again, if you’re going to study the effect of procedures on angina, it is imperative patients with angina are being tested. In 1959, the cardiologist taking care of the man with typical angina, but without concomitant definitive ECG changes during stress had no avenue available to clarify the diagnosis. In this case, there are two possibilities if patient #14 had angina that completely resolved with parasternal incisions – either the mind overpowered whatever the mechanism of angina really is, or that this patient never had angina. If you are a cardiologist that believes in the power of the mind to overcome angina, perhaps we can begin to meditate heart failure away as well. While some are using ORBITA to embrace the placebo effect, it is worth noting that the effect size of the placebo in ORBITA was less than impressive. The sham group improved an average of 11 seconds with a confidence interval that crossed zero. This means that the true effect size of the placebo may very well be zero. It should reassure those who believe in science rather than magic that ORBITA allows us to tell patients that spinal manipulations and ginger root are bound to be ineffective for the treatment of coronary artery disease. The notion that the truths in ORBITA will be revealed through a better statistical understanding of the methods used to analyze the data is wishful thinking. Data crunching wizards they may be, but statisticians are limited to the dataset collected. In the case of ORBITA, for instance, only clinicians can speak to the veracity of the dataset collected, if the mean response found is one that is clinically meaningful and how generalizable the mean observed response is to the population seeking treatment. ORBITA well represents patients being stented in cath labs today. But that does not, unfortunately, make it a good trial to answer the narrower question of whether stents can improve angina or exercise duration. The ACME trial may not have been a sham double blind trial, but the rigorous entry criteria ensured patients enrolled actually had angina – a disease that would be amenable to revascularization. It is also hard to use ORBITA to bury stents because the trial was underpowered to examine the other reason stents are placed in coronary arteries : the prevention of future heart attacks. In the FAME2 trial of stable coronary artery disease, that excluded patients with an FFR of > 0.8 and was therefore more homogenous than the patients in ORBITA, the effect of stents was relatively modest – it took one year to show a 9% event rate with medications vs. a 4% event rate in the stent group. This 5% absolute difference may seem miniscule, but when applied to large populations carries weight. I can guarantee you that if bike lanes demonstrated a 5% absolute difference at 1 year there would be calls to expend massive resources to give everyone a bike from the same group burying the coronary stent. As I write this, I am a few hours removed from watching a 66 year old burly man clutch his chest 4 minutes into an exercise treadmill stress test. His electrocardiogram showed no significant changes during the event, but he looked uncomfortable enough that I stopped the test to let him recover. He described a feeling of tightness, that resolved as he sat with his chest heaving on the exam room table. He has diabetes, hypertension, and had a carotid stent placed in the last year. He also is being worked up for interstitial lung disease. There is close to a 100% chance he has coronary artery disease – the only question revolves around it’s significance. His low exercise tolerance could be from his lung disease, but could also portend a limitation due to significant coronary artery disease. I’m sending this gentleman to the cath lab to rule out significant coronary artery disease. If he does turn out to have a ORBITA like lesion that is physiologically significant (we can quarrel about thresholds), I can’t say that I am going to lose sleep over a stent being placed even if I can’t be sure his symptoms definitely relate to his coronary lesion. It’s certainly plausible that given his low exercise time (relative to the ORBITA mean) his expected effect size may be much higher than the average observed in ORBITA, and a low FFR suggests that more often than not stenting will make it less likely he needs an urgent revascularization. Speaking as a preventative cardiologist who has no financial incentive to the placement of more stents, ORBITA makes me think hard about what to say to patients I send to the Cath lab, but shouldn’t lead to changes in the practice pattern of conservative cardiologists loathe to send minimally symptomatic, high baseline functional capacity patients to the cath lab. On the other hand, ORBITA should stay the hand of those in the ER employing a shoot first, ask questions later approach to patients presenting with chest pain. The clinical history, somewhat quaintly, remains paramount. I have always thought it a particularly dark feature of human nature that relishes in the fall of those who have reached great heights. The jubilation with which some are ready to bury the coronary stent for stable coronary artery disease comes from this same place. Those who overreach, stumbling over themselves to drive the final nails in the coffin of stents do so by ignoring a wealth of clinical data based on a robust physiologic model. Stents in the setting of stable CAD clearly appear to have been overused, and in response to data demonstrating the success of medical therapy in a large number of these patients – stenting in stable CAD since 2007 has fallen 50%. If stents in this group really carry risk with no reward – we should expect lower cardiovascular deaths nationally. Yet the cardiovascular death rate per year isn’t just flat – its rising. There is a reason sledgehammers are not the tool of choice for sculptors – the tools needed to convert stone to flesh require fine, discriminating tools. ORBITA deserves its place as an important trial adding to the significant body of evidence that should help guide decisions to revascularize patients with stable coronary artery disease. Much of the lay press, as well as those worshiping at the temple of mindless empiricism have naively used ORBITA to malign all stents placed in the setting of coronary artery disease. While it may be tempting to use the recent evidence as a sledgehammer against cardiologists and stents, there is a real danger this approach ends up leaving patients with the greatest damage. Not sure your logic correct, Anish. Not doing something that doesn’t work when the alterntaive is not marginally better will lead to nothing. Perhaps the marginal harms wash out and harm of cath is low, really, and difficult to measure in a complex population. As noted below, the decline in mortality over decades seems unfazed by our actions to the heart. And this is not the first trial to show that stents don’t help (Hadler). Time for cardiolgy to find other work, like finding out what really matters. Complete occlusion lead to death of myocardium. Shld we stop stenting acute MIs? Who needs to do a cards fellowship when you can read Anish’s blogs? Good point. Cardiovascular death rates have been declining in an essentially monotonous fashion since the late 1950s or early 1960s (depending on how you count them). This may be an insignificant blip, and the methods to compile these types of statistics are not the most accurate. My point was to say that if the charge is accurate that patients are being harmed by stents – Doing way fewer should yield some more impressive results. If our major problem today is overuse – shouldn’t doing much less be beneficial. Clearly we’re not getting better. 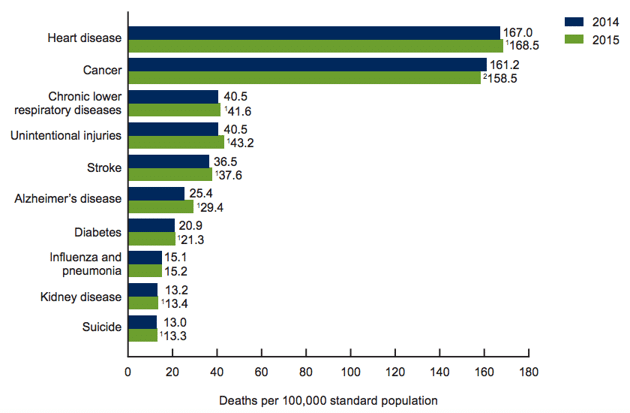 The higher CV death rate is 1 yr.. many possible reasons, or just a blip. And then…there’s Takostubo cardiomyopathy…now what is really real? Kudos to Dr. Koka for the extended analysis of interventional cardiology, in flux.